This year's Welsh Open took place less than a week after the Viking Race. 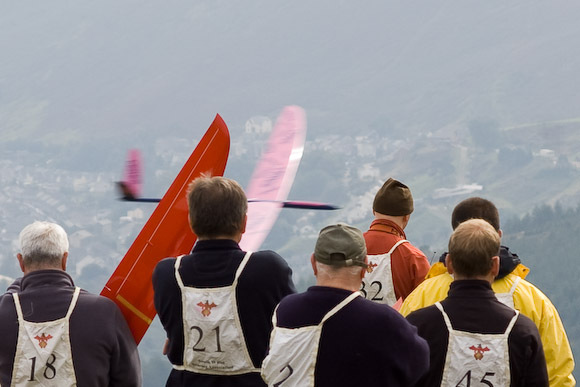 With the resulting extra pressure on organisers and competitors, entry was restricted to a rather more manageable 45 pilots (compared with 55 last year), and the duration - normally three days - was reduced to two. Nevertheless, it still had all the flavour of a major F3F event, with several top pilots from around the world in attendance. It was great to see old friends from Spain, Germany, France, Norway and Hong Kong, and some new faces as well. For the first time in weeks, the rain actually stayed away. Too good to be true? Yes - we had to contend with variable wind conditions instead! That, combined with thermic conditions, made for a mixture of happy and frustrated pilots. On both days the start was delayed while we waited for the wind to blow, but thanks to some excellent calls by CD Kevin Newton, the delays were minimised by having the course set up in advance on the correct slope. As a result, we managed to fly one and a half rounds on the first day (Mickey's slope). The flying on Day 2 took place on the back of the Wrecker. We managed to complete both Round 2 and Round 3, but sadly the comp had to be abandoned when the wind died just short of the minimum 4 rounds required for a Eurotour score. Based on the scores over the three rounds, John Phillips (Masterpiece) was declared Champion by a whisker from Espen Torp (Ceres), with Pierre Rondel in third spot (Ceres). Fastest time was 42 by JP. Well done to all. A summary of the results is at the end of this page. CD'ing and organisation on the slope were spot on. Thanks are due to Kevin, Andrzej, and all those who helped with buzzing etc. Kevin in particular had returned from the VR only a few days prior to the Welsh Open, and had therefore devoted all of the last three weekends to competing and organising! A marathon indeed. Thanks also to the competitors who made the journey from abroad to make this another fine event. Raffle prises of a Banana and Air One Mini were generously donated by SlopeRacer.co.uk. Please show your appreciation by having a look round their web site, there are lots of goodies on show, all of them with wings! Thanks also to Wan Kin for donating Sanwa servos for the winners. High res are available on my SmugMug gallery.